❶ bracelet description and story An ellipse consisting of layers of layers Four squares No fixed each other Group cooperation Can also stand alone **All brass beads are not fixed** **Will slide around and slide around** **Arranged all the time** ❷Bangle color (please write down in the remarks column when placing an order) 配The color on the photo is light coffee. 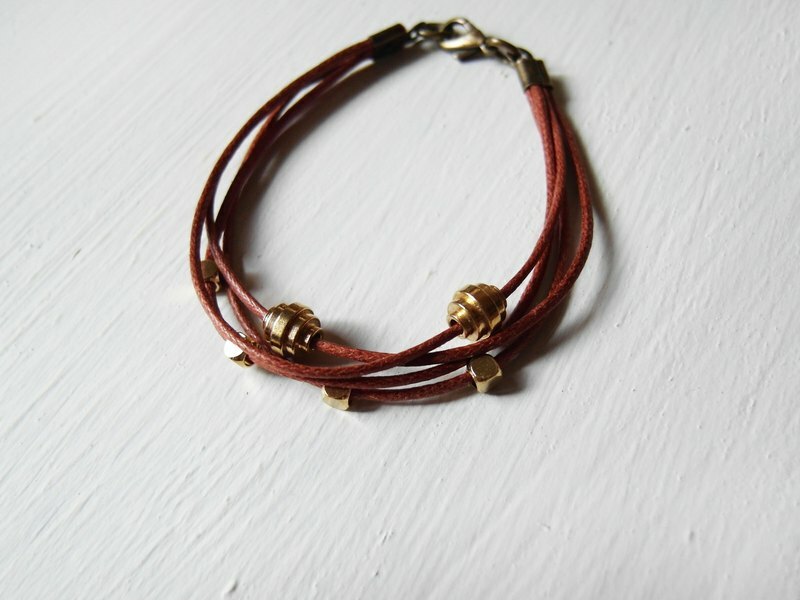 This bracelet can be used with 1 color ▼▼ color is as follows ▼▼ https://farm1.staticflickr.com/499/19928794732_d76a5c841d_b.jpg https://farm2.staticflickr.com/1848/29882792567_32e0275d59_b.jpg https://farm2.staticflickr.com/1856/29882792357_beb437b22d_b.jpg https://c2.staticflickr.com/8/7191/27690986401_78b03195f5_z.jpg ❸Bracelet material and size Imitation leather rope material Brass square plane is about 0.25 cm wide Brass ellipse is 0.6 cm long A single imitation leather rope is about 0.1 cm wide The buckle parts are all bronze accessories **Brass material will not rust or oxidize under normal use, and there will be retro matte after a long time. ** ✎Measure hand circumference method (please write the size in centimeters in the remarks column when placing an order) ★ Completely customized ★ Please make sure to measure the size (Zoe will make the order after confirming the size) Zoe will add the length of the buckle when making it. https://farm9.staticflickr.com/8790/16898269280_3e13daf6d7_o.jpg ❹Usage and maintenance methods I don’t want to look at the dear under the leather rope (Zoe itself will wear a bath) If it touches the water, please dry it immediately (expand the life of the bracelet) It is normal to gradually fade the bracelet as it touches the water. Do not mind the dear and then place an order, or launch. ❺Designer and brand profile ✎__Each bracelet has a unique story__ __Also represents a kind of mind and desire__ Simple lines Do some weaving to become a story One accessory a gift I only hope that the person wearing the bracelet can continue the idea of a good mood with Zoe.